Your patio is multipurpose. Sometimes you want to entertain, and there's nothing better than a nice barbeque or party in the backyard in the warm weather. Other times you just want to sit on your patio and relax. The key to both of these different activities is proper design, but that can be tricky for a lot of people. Figuring out how to realize a design concept can be very difficult, which is where our Arizona landscape design and patio design company comes into play. We know that you want to entertain and to relax, and that's why we're here to help. We'd like to take a brief moment right now to look at some of the basics behind patio design and hardscape design and why we are invaluable to you to bring out the best in your yard. Your patio and backyard are an extension of your house and your personality. A lot of people want to have this space be properly realized. And out here in Arizona, it means a mix of hardscaping and xeriscaping. By finding the right mix of colors and materials to go with the natural landscape of your backyard, you can bring out a lot of beauty in your surroundings. The above is easier said than done, as you might imagine, which is why you really shouldn't go about this alone. 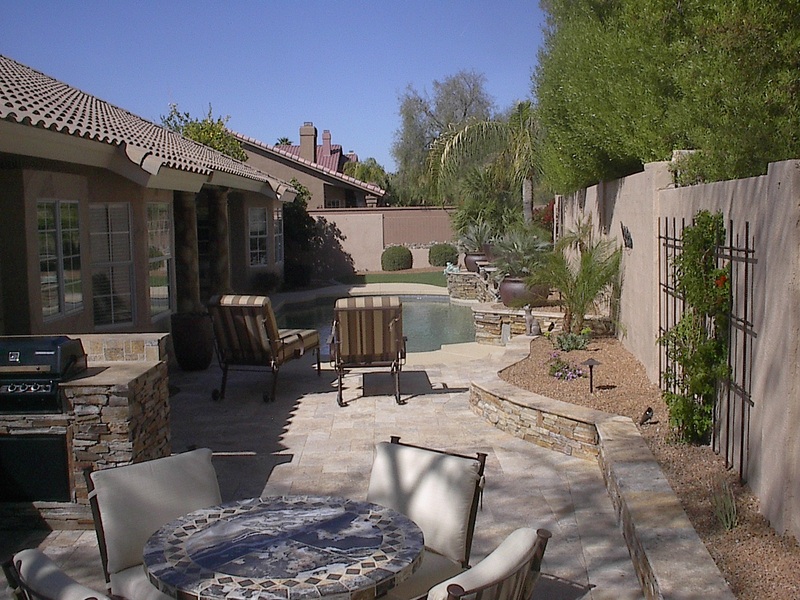 By consulting with experts in landscape design in the greater Phoenix area, you'll be able to save yourself a lot of hassle and a lot of costly trial and error. Experts in patio design and landscape design know how to get the most out of materials and the most out of your space. They know what kind of natural stones and paving stones might be best for your needs. Going with these materials might be better than just using concrete, for instance, and it may better integrate the patio with the natural features in your backyard. If you're looking for more ornate concepts, like fountains and walkways, our abilities and years of experience will prove absolutely invaluable. These sorts of complicated creations require lots of know how to pull off. We offer our clients our expertise, our knowledge, and great customer service. More than that, though, we offer our reputation and a great ability to listen. This is your space and your place, and our Arizona hardscape design team will be here for you to make sure that your vision is realized. We'll provide input that can enhance your concept and help you make the best possible decisions about the whole look and feel of your yard. We're not just working for you, we're working with you. If you'd like more information about patio design, hardscape design, and other outdoor concepts, we encourage you to contact our Anthem, Arizona landscape design company today. The team here is looking forward to meeting you in person and helping you create the design concept that you have always wanted to see.